In this article I'll walk you through the step-by-step process of performing an oil change on your Onan RV generator. The Onan generator manual recommends changing the oil each year or every 100 hours of use. This is a maintenance task that you could certainly do yourself. A really cool aspect of traveling in an RV is the ability to be self-sufficient. With an onboard generator you can generate your own electricity when you need it. Like any other engine though, your Onan generator requires routine maintenance and attention. A healthy generator is one that gets regular exercise. Whether you use your generator or not, you should start it up periodically and let it run with an electrical load on it. I run my generator for about an hour each month. While running, I'll turn on my A/C and electric water heater. When you run your generator it circulates your oil and lubricates the components. It also gives you confidence knowing that it will fire up when you need it. The Onan generator manual recommends changing the oil each year or every 100 hours of use. Changing the oil is not difficult and takes less than an hour. If you've changed oil on a car or lawn mower, then you will a familiar process for you. Just make sure you have the right tools and materials before you start. Click below to watch my video and see how easy it is. Please not that there is no oil filter on my MicroQuiet 4000 generator. Other models do have oil filters that will need to be changed, so review the manual for your model before taking on this project. You'll need a drain pan to catch the old oil. I like to use this kind of funnel which has measurement guides on the side. It helps to ensure I put the exact amount of oil in. 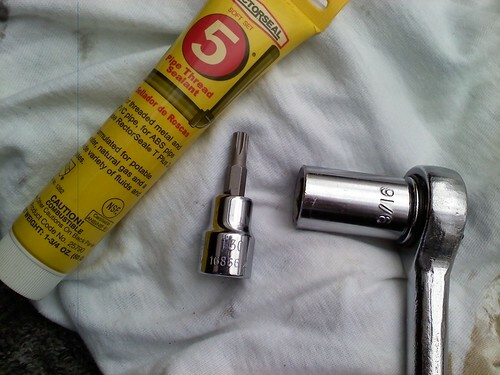 You will need one of these Torx bits to remove the drain plug panel under the generator. You will need a 9/16 socket to remove the drain plug. The drain plug is recessed inside the generator so a deep socket works better. I like to put some pipe thread sealant on the drain plug before I screw it back in. This just helps prevent corrosion and leaks. 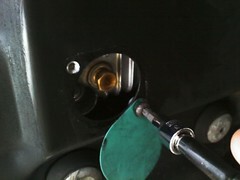 Using T-30 Torx bit/socket, remove the green panel on the underside of the generator that covers the drain plug (see photo). Note: You only need to remove one screw then loosen the other. Then just swing the panel off to the side. That's it, you're done! Run the generator for a few minutes and check for leaks before screwing the drain plug panel back on. 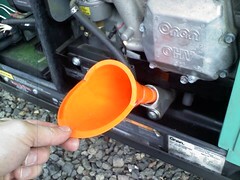 Before I button up the generator, I take a few minutes to inspect the air filter, and wipe down visible areas. Finally, I log the date and generator hours in my RV maintenance log. VIDEO: Having Trouble Starting Your Generator? Try This SIMPLE Fuel Filter Test.